This is a unique opportunity to design a state-of-the-art 21-acre neighborhood surrounded by over $3 billion of investment planned by the public and private sectors. By 2030, the City of LA anticipates the number of jobs in this area to increase by 50%, primarily due to the Port of LA’s plans for growth, which will drive increasing demand for housing and retail, multiplying the impact of further investments. HACLA seeks compelling proposals from Developers and/or Development Teams to transform the Rancho San Pedro (RSP) public housing site, located at 275 West 1 Street, San Pedro, CA into a vibrant mixed-income/mixed-use community that interconnects with the neighborhood. Developers, in coordination with HACLA and RSP residents, will embark on a collaboration to fulfill this tremendous opportunity and must commit to leveraging the full potential of this site. The selected Developer must capitalize on the location and surrounding investments to create a public/private model that leads the country in innovation, community engagement and sustainability. San Pedro is home to the busiest container Port in the western hemisphere and the World Cruise Center. LA’s thriving seaport, is an anchor institution, managing record-setting cargo volumes, moving billions of dollars of cargo annually and attracting 602,402 cruise ship passengers to LA’s World Cruise Center. The Port has embarked on a 10-year, $2.6 billion infrastructure investment program, so that its efficiency and productivity will continue to increase and its base of jobs and economic impact will continue to grow. For much of the 110-year history of the Port of Los Angeles, San Pedro has been a beacon of innovation and economic vitality for all of Southern California and beyond. That’s particularly true now, as the port leverages an array of environmentally friendly and forward-facing technologies to automate the way it handles the nearly $1 billion worth of goods that flow through its 7,500 acres every day. Retail and Entertainment The Ports O’Call transformation into the San Pedro Public Market, includes a new retail and dining destination with live entertainment, interactive family-friendly attractions and year-round events. The first phase of the Public Market development includes $150 million in investment, completion is slated for 2021. A fleet of rubber-tire trolleys is planned to carry passengers throughout the wider waterfront and downtown San Pedro area with connections to nearby destinations. A bike-share program has been discussed as well. Also in 2014, a $32M promenade and outdoor movie screening space opened up on the waterfront. A $125M revamp of the Cabrillo Way Marina wrapped up in 2011, and the Battleship IOWA opened to visitors a year later. New businesses have popped up too, like the artisan goods marketplace Crafted at the Port of LA, opened in 2012, and the local craft brewery, Brouwerij West, opened 2016 in a historic Navy warehouse. Research and Education AltaSea will be a leading, world-class urban marine research and innovation center at the Port of Los Angeles. An unprecedented collaboration among government, business, marine science, education and philanthropy, the AltaSea public-private partnership has been created to transform the historic City Dock No. 1 site at the Port of Los Angeles into a nexus for research on ocean-related problems critical to Southern California, the nation and the world. The center will bring together researchers and scientists from major colleges and universities, government agencies and industries to study and develop innovative global solutions to benefit generations to come. Partners include Dr. Bob Ballard’s Ocean Exploration Trust, the Boys and Girls Clubs of the LA Harbor, Ben Lecomte’s The Longest Swim, the Southern California Marine Institute, and the Los Angeles Cleantech Incubator. AltaSea funding partners include the Annenberg Foundation, U.S. Department of Commerce, philanthropist Morton LaKretz, The Rosalinde and Arthur Gilbert Foundation, the Goldhirsh Foundation, the Roy and Patricia Disney Family Foundation, and the Port of Los Angeles among many others. Retail and Entertainment Since 2012, Crafted at the Port of LA provides a large-scale permanent handmade artisan marketplace with more than 100 individual artists and food makers. The marketplace hosts daily demonstrations, projects, as well as live music, special events and food trucks, as well as a craft brewery. For 20 years, the community has participated in a First Thursday ArtWalk, one of the first in the region. Thousands of local residents show up every First Thursday to celebrate the visual arts, socialize, and patronize participating restaurants. Arts and Culture Over the last decade, the artist community has grown significantly in San Pedro. The State selected the San Pedro Waterfront Arts, Cultural and Entertainment District as one of only 14 designated Cultural Districts in the State because of its thriving cultural diversity and unique artistic identity. The San Pedro District is home to over 90 visual artists as well as restaurants, performing arts venues and art galleries. The district is anchored by the Warner Grand Theatre, a 1,500 seat historic art deco movie palace, Little Fish Theatre, which presents repertory theater in a converted garage, and the Loft Studios, a three-story warehouse with a concentration of fine artists. The District’s streets are lined with artists’ live work spaces. The historic core of downtown San Pedro has been renting to artists since 1944, with studios in storefronts and warehouses alike. Many commercial buildings also house studios, organizations and work/live options in the district. Housing and Retail Several new mixed-use developments are underway or proposed, including: a new six-story residential building with 404 apartments and ground floor retail at 5th and Palos Verdes Streets; 24 new rental townhomes at 8th and Centre Streets, and 22 new homeownership townhomes at 18th and Mesa Streets. Plans for further revitalization efforts include: 1) City’s redevelopment of underutilized public property in the area and 2) LA County’s proposed redevelopment of a former County Courthouse at the corner of 5th and Centre Streets into a mixed-use development. Community Connected to Downtown Los Angeles by the 30-mile long Harbor Freeway (Interstate 110), San Pedro is a 12-square mile community of over 83,000 residents located at the southernmost point of the City. The neighborhood includes a mix of single family homes and low-rise apartments, with a 44% homeownership rate. The development site and the larger neighborhood have significant redevelopment potential, located within walking distance from the San Pedro historic downtown waterfront. The area features shops, hotels, restaurants, art galleries and theaters. 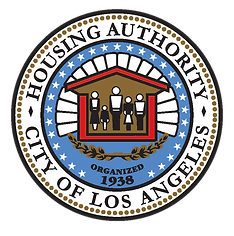 HACLA applied in August 2017 for a $1.3M HUD Choice Neighborhoods Planning and Action Grant for the RSP public housing site. HUD plans to announce awards for this grant in January 2018. The grant would provide funding to develop a RSP revitalization plan and will be matched by $300,000 in funds by HACLA for predevelopment funding and $200,000 in funds from the City of LA for community investment activities. The LA City Council approved the Community Plan for the larger San Pedro neighborhood in October 2017. Plan Boundaries The San Pedro Community Plan Area is generally bounded by Taper Avenue on the north; John S. Gibson Boulevard, Harbor Boulevard, the West Channel of the Port of LA, and Cabrillo Beach on the east; the Pacific Ocean on the south; and the City of Rancho Palos Verdes on the west. The Community Plan Area encompasses approximately 3,674 acres and is one of three located within the City’s Harbor area. The community is located within City Council District 15 and includes 3 Neighborhood Councils. San Pedro Located at the southernmost portion of LA on the Palos Verdes Peninsula, the community includes many neighborhoods important to the diverse cultural tapestry that is LA. San Pedro’s maritime history directly correlates to its rich cultural heritage of ethnic diversity. This includes Japanese immigrants who helped establish a viable fishing industry in San Pedro, as well as seafarers and fishermen from Europe’s Dalmatia region. San Pedro became a melting pot of Italians, Portuguese, Serbo-Croatian, Scandinavian, Greeks and Japanese immigrants. Today, San Pedro is the heart of the Croatian community in Los Angeles, and home to a diverse population, including Latino, African and Italian-Americans. Downtown San Pedro has an active business district between 5th and 7th Streets that includes a mixture of small local retailers, restaurants and galleries. There is a very active business improvement district managed by the San Pedro Property Owners’ Alliance that focuses on public safety, street cleaning, beautification, and marketing activities. Historic downtown San Pedro is just steps from the waterfront and features small town charm with a collection of family-owned businesses. Several restaurants, pubs and coffee houses offer outdoor dining and nightly entertainment. In the evening, the downtown streets are lit up with Tivoli Lights. The Downtown San Pedro Arts, Culture and Entertainment District and its immediate surroundings are home to over 90 visual artists as well as restaurants, performing arts venues and art galleries. The district is anchored by the Warner Grand Theatre, a 1,500-seat historic art deco movie palace, Little Fish Theatre, which presents repertory theater in a converted garage, and the Loft Studios, a three-story warehouse with a concentration of fine artists. The District’s streets are lined with artists’ live work spaces. During the First Thursday of every month San Pedro’s downtown businesses, restaurants, and art galleries and studios stay open late and host an unique event with free music, art and street performances. The Historic Downtown San Pedro Local Harvest Farmers’ Market is open every Friday. The market includes local musicians performing with farm fresh fruits, vegetables, plants, flowers, gourmet specialty foods arts and crafts vendors. As part of Mayor Garcetti’s Great Streets Initiative, $1.3 million in gateway improvements were recently made on Gaffey Street. The LA Conservation Corps is landscaping the median from O’Farrell to 7th Streets using a Community Benefit Grant from the Harbor Community Benefits Foundation (HCBF). The LA Neighborhood Initiative has been awarded a Community Benefit’s Grant from the HCBF for 1 st Street improvements, between RSP and the Port of LA Administration offices, and will commence design work in collaboration with the RSP residents and City staff in early 2018 with completion estimated by the end of 2018. Key neighborhood assets include: the Boys and Girls Club of LA Harbor; Toberman Neighborhood Center, a neighborhood-based youth and family services non-profit; Harbor Community Clinic, a Federal Qualified Health Center; Pacific Gateway Harbor WorkSource Center; Santa Cruz Head Start, operated by Volunteers of America; the Port of LA High School, an award winning public charter school; Barton Hill Elementary School; and LA Harbor College has a campus just north of the area. San Pedro is served by a commuter express route and several local Metro transit routes that run on its arterial streets. The closest commuter rail service (to Downtown Los Angeles) is accessed at the Metro Blue Line station in the City of Long Beach. San Pedro Regional Library is a 20,000-square foot library has over 132,000 catalogued volumes. It hosts many community programs and seminars, such as English as a Second Language classes, Pre-School Story Time, Science Projects, Arts and Crafts, and Book Clubs. Rancho San Pedro is in LAUSD Local District 8, which includes Barton Hill Elementary, Richard Henry Dana Middle School and San Pedro Senior High School.